It’s the most basic and one of the strongest elements used to define a space, create a mood, or change a look. We all say: “Just add some color!” And it’s great that within a few hours, a room can have a whole new feel. Maybe it’s even an old piece of furniture: change the color, and it totally transforms the piece. But today I want to talk about paint itself because after you’re finalized the color you need to decide on the finish. Will it be a Flat Finish? Well, I’m not particularly a fan of flat finishes (and certainly not for walls.) But it is good for ceilings that have a lot of imperfections because there are no shiny areas for light to be reflected off waves or nail marks or areas that were patched. And what about Pearl Finish? This is my favorite: it has a bit more sheen than eggshell and is very smooth to the touch. I think it also enhances beautiful colors and the higher the gloss, the easier it is to clean. But sometimes I get painters who don’t like to work with it because they can’t touch it up as easily as eggshell. This may be the case, but if you’re working with a quality painter, they will do a good job with it. If you’re painting the walls yourself, it may mean that if you have to patch an area then you will have to give the full wall a coat so keep that smooth look. I think it’s worth it. Semi-gloss? 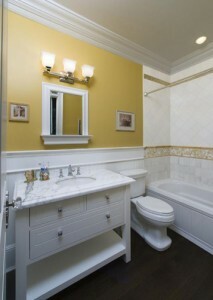 This is a good paint for high moisture rooms like bathrooms. It cleans great and looks good on doors and moldings. And I am also a big fan of a High Gloss finish for moldings and doors. It catches the light great and is very washable. When selecting a color, bear in mind that the finish you choose will change the color slightly. All of the small paint samples from paint stores are supplied in a flat finish. As it gets shinier, the color will appear lighter. You can adjust for this by selecting a slightly darker tone so when it is used in, say a semi-gloss finish, the color will be just what you want it to be. If you want to get the color just right you can buy a small jar of paint these days and test it on the area you want to make sure it’s perfect. Depending on the line that you’re going with you will sometimes see a Matte or a Satin finish. The Matte is closest to a Flat finish and the Satin is closest to an Eggshell. And a final recommendation: go with a paint that has low or no-VOC (volatile organic compounds.) Those are the elements that cause that new paint smell. While I was raised on that smell and kind of like it, it’s not very good for you. It’s much healthier for you not to have these elements so that you can sleep in the bedroom the same night without being bothered by it, and the no-VOC qualities are especially good for kids. For more information, click here for another post on the QUALITIES OF PAINT.